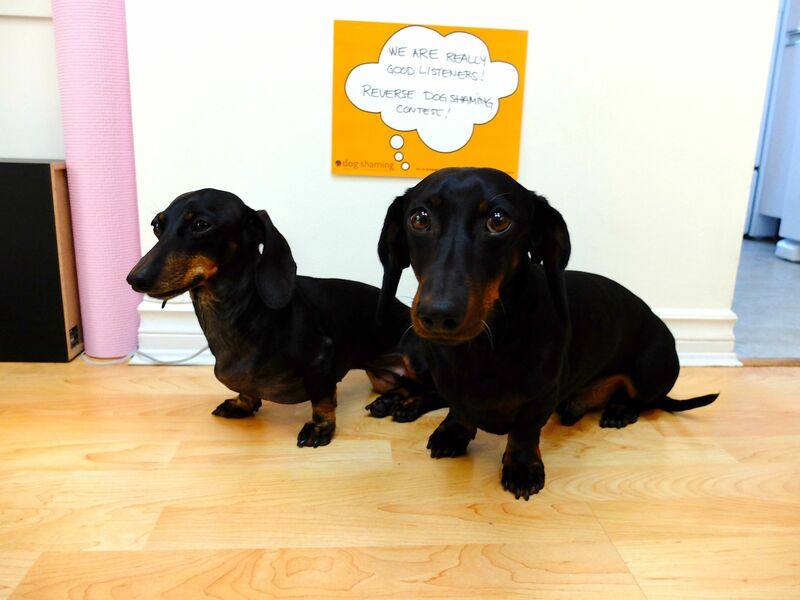 “We are really good listeners!” Dog Shaming’s book comes out in 10 days!! The whole team is super excited, Beau even peed on the floor a little. We were lucky to receive a few extra copies of the book so we’ll be giving them away (along with a bunch of other goodies) on September 24th! How can you win this awesome dog shaming contest? Do you love your pet and does he or her make you smile? Do you want a personalized, signed copy of dogshaming for your very own? If you answered yes to both those questions, then you’re in! We’ve been shaming our dogs for over a year now, and it’s time we give back to them. Our pets can be our number one source of frustration, but they are also bring us so much joy. Submit a picture of your animal along with a sign that tells us why your dog, cat, rabbit, or chinchilla is awesome! Make sure the title of your submission says “REVERSE DOG-SHAMING CONTEST”. Maybe you’ve trained your cat to use the toilet! Or, you have a parrot who likes to sing ACDC songs! Whatever the case may be, let’s give those pets some respite and show them we appreciate them a whole lot! I’ll be posting the best submissions throughout the next seven days (spaced between our regular programming), letting you wonderful readers pick the ones you like the best; by facebook like, tumblr like and reblog, and by twitter retweet! So get your friends involved because they will help you win! I’ll be tabulating the votes and picking five winners to send care packages to! Posted September 16th, 2013 . Those doxies are absolutely adorable! Oh come on .. No reverse shaming .. it will make the dogs laugh at us !! Very excited about this project! Oh Awesome!!! I have been wanting to post my dog on here for ages but he never does anything wrong!! YAY! !